Google is bringing some of the features previously exclusive to Pixel 2 phones onto the original Pixels with Android 8.1 developer preview. Google's original Pixel smartphones are getting new features that were previously available exclusively on the second generation Pixel 2 smartphones. The new features are arriving as part of the Android 8.1 developer preview, including the new search bar which offers a more unified search than before. The original Pixel smartphones launched with a search bar that only matched search with relevant apps. On the Pixel 2 and Pixel 2 XL, however, the search works a bit differently by showing past searches and returning web pages as results alongside apps. The new search bar is more unified and combines the power of Pixel's app drawer and mobile search. The feature is also accessible while searching for things from the home screen. It also must be noted that the update brings design tweaks to the search bar with rounded corners and the Google logo moves to the left-hand side. Overall, the search experience on the Pixel and Pixel XL is now at par with that of the Pixel 2 and Pixel 2 XL. Last month, Google announced Android 8.1 Oreo preview, which brought some of the new software features launched alongside the Pixel 2 and Pixel 2 XL. The update brought some parity between the original Pixel and the new Pixel 2 smartphones in terms of appearance. Like the Pixel 2, the search bar is now placed between the icons in the dock and the navigation buttons. The Pixel and Pixel XL now support a transparent app drawer and at a glance widgets. The update is being rolled out starting today for Pixel and Pixel XL owners enrolled to the Android 8.1 developers preview. The rollout comes in the form of a server-side update and will be available in a phased manner. If you don't see the update just yet then wait a bit and you should see the notification in the coming days. 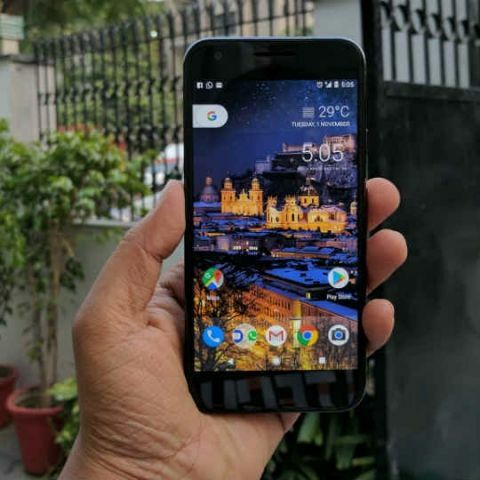 Which phone to buy Pixel or one plus 3? what is the meaning of Ultra pixel camera used in HTC?